I'm not a foodie & I don't read foodie books. I enjoy cooking, especially baking, but I don't long to live in a Tuscan farmhouse, growing my own kale & keeping heritage chickens. I'd heard of Ruth Reichl & read admiring reviews of her earlier books but hadn't been tempted to pick them up. This book is a little different. 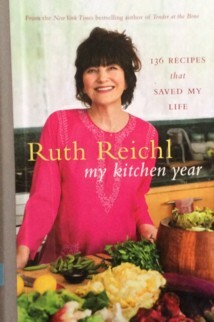 The subtitle is 136 recipes that saved my life, & My Kitchen Year is a beautiful blend of memoir, recovery story & cookbook. Ruth Reichl was the editor of Gourmet magazine, probably the most prestigious magazine about food & cooking. In 2009, Reichl had been editor for 10 years when the owners, Condé Nast, abruptly decided to close the magazine down. It was October, the December issue of the magazine was at the printers, Reichl was completing work on a TV series & promoting the latest in a line of Gourmet cookbooks when the axe fell. At first, she just kept working, there was nothing else she could do. She had a book tour organised & although the last thing she wanted to do was go out & talk about Gourmet magazine, she couldn't let down the bookstores & the readers who wanted to meet her. In between commitments, Reichl retreated to her kitchens, in New York & the country house in upstate New York where she & her husband spent weekends & holidays. After clearing her desk & completing the book tour, the reality of losing her job hits. On the first day of my new life I woke, alone, to frosted windows in New York City. Michael was out of town, and for a moment I thought gratefully that I had no responsibilities, nowhere to go. Then the empty day rose before me, and I realised that that was literally true. I had nowhere to go. What would I do with myself? I went into the kitchen and opened the refrigerator door. Reichl's husband suggests that they might try living year round in the country. If Reichl doesn't get another job, they'll have to sell one of their homes. She realises how much she has missed cooking meals that aren't just thrown together after a long day in the office. She rediscovers New York through walking, visiting different districts & trying out new ingredients. She visits the farmers markets near their country home & finds herself creating a meal in her head as she looks at what's on offer. This book almost convinced me that Twitter could be a worthwhile activity. Reichl discovers a whole new community of friends on Twitter (some of her tweets are reproduced in the book). The power is cut off at Reichl's country house for several days during the winter, just as she had made some bread dough. The storm raged but I didn't mind; I was feeling more optimistic. What I did mind was that the electricity had deserted us while my dough was rising, and I didn't know what to do. It might be days until I had a working oven. Should I throw the dough out? I tossed the question into the Twitterverse and the responses came back. 'Don't throw it out!' at least a dozen people tweeted. 'Just keep punching the dough down'. Convinced that it was a lost cause, I did it anyway. What did I have to lose? The electricity was out for three days, and by day two I was noticing a change. The dough was capturing wild yeasts with great abandon, and before long it began to smell like fine champagne. I could hardly wait for the power to be restored. One of her former colleagues on Gourmet had suggested she write a cookbook & the idea appeals to her new self. She realises she would rather be at home in her kitchen than eating out at fancy restaurants on an expense account. For the past six months, cooking had been my lifeline, and I was grateful for everything I had learned in the kitchen. Most cookbooks, I thought as I reached for an orange and began to squeeze it for juice, are in search of perfection, an attempt to constantly re-create the same good dishes. But you're not a chef in your own kitchen, trying to please paying guests. You're a traveller, following your own path, seeking adventure. I wanted to write about the fun of cooking, encourage people to take risks. Alone in the kitchen you are simply a cook, free to do anything you want. If it doesn't work out - well, there's always another meal. When Reichl breaks her foot after stumbling in a restaurant in LA, she has a lot of time to think. She consoles herself for not being able to cook for weeks by thinking about recipes & encouraging her husband to cook. I also love that she has two cats who take advantage of her immobility to make themselves comfortable. I think all cat owners have experience of this! She is writing an Introduction to a new edition of Elizabeth David's recipes & compares David's influence on English food to American writers like Julia Child & James Beard. As the year turns to autumn once more, Reichl considers a new project. Summer over, cookbook done, I was back in a state of anxiety. I lay fretfully in bed at night. knowing what I should be doing and yet reluctant to commit. I have always wanted to write a novel. I'm an avid reader, and fiction is my first love; the ability to inhabit someone else's space, even for a little while, makes life so much richer. I've dreamt of writing a novel since I was very small, but I'd always put it off, finding all the reasons why I couldn't do it. I had a job, a child, no time. Now my child was grown, my job was over and my days belonged to me. The time had finally come. Surely it couldn't be that difficult? But the middle of the night is no time to look for answers. I got out of bed and went into the kitchen. I wanted some hot dark fudge poured over cold white ice-cream, and I knew that just stirring up the sauce would improve my mood. Apart from anything, the book itself is beautiful. The book follows Reichl through the year after Gourmet closed down. The photography by Mikkel Vang is just gorgeous. The evocation of the seasons through food & scenery is luscious. Following the seasons from the first misery of unemployment in autumn to a place of acceptance & recovery at the end of the following summer is a very effective way of structuring the story. As expected from a writer as renowned as Reichl, the text is intimate & honest, at times it's very moving. This is a memoir about what it's like to lose a much-loved job, a job that defined who you are. It's about the fear of not finding another job at all (Reichl is in her 60s), & what that would mean financially as well as personally. We don't all have the high profile career of Reichl or her privileges but we can all imagine what it would be like to be suddenly unemployed & trying to work out what comes next. It's also a book about food, our relationship to food & the joy of slowing down & really looking at what we eat, where it comes from & the way we cook. The recipes are classics, new variations on old favourites & ideas prompted by new discoveries. My Kitchen Year is a book about food & cooking for non-foodies, a memoir of the grief of unemployment & a gorgeously produced coffee table book of photographs & recipes. I enjoyed it very much. Oh Lyn "to live in a Tuscan farmhouse, growing my own kale & keeping heritage chickens" is my foodie dream, Thank you for this review, I am going to order it online right now, it will be my present to myself for my birthday. It is a lovely book for foodies so I hope you enjoy it. Happy Birthday! I wasn't especially drawn to her when I read some of her earlier memoirs...but in this one she sounds easier to relate to. I think the redundancy theme is pretty universal & it made her experiences easy to relate to. The book itself is really lovely too.